Check your Dashboard Alert: Failed Signouts to see a list of Students and Staff that have a previous Clock In time without a corresponding Clock Out time for the day. You can assign the Clock Out time to each individual missing this entry or you can give all results the same Clock Out time using Set Out-Time for all Failed Signouts at the top of the page. Double check the Key Metrics on your Dashboard for new Web Registrations and Parent Portal Enrollments / Requests. 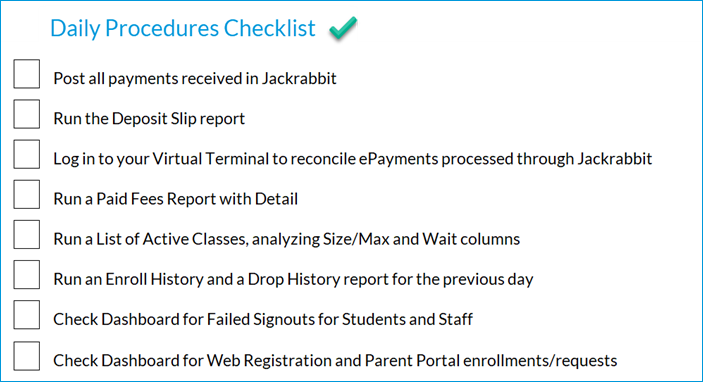 Requests should be scheduled or denied by a Jackrabbit user, while also verifying all related fees have been posted (registration fee, tuition, etc). Tuition fees are not automatically posted unless your database is Class Based Billing and has the setting turned on to post tuition fees automatically. Registration fees for Parent Portal enrollments will need to be posted by a Jackrabbit user. Using Post Annual Fees allows you to post registration fees to all enrollments within a chosen date range at once!